A very popular wedding trend that we have seen done beautifully at WhereBridesGo.com is the sparkler exit. They are romantic, exciting, fun, and produce gorgeous photo opportunities. If this is something you would like to add into your wedding planning, there are a few precautions you will want to take to make sure it goes smoothly and there are no accidents. 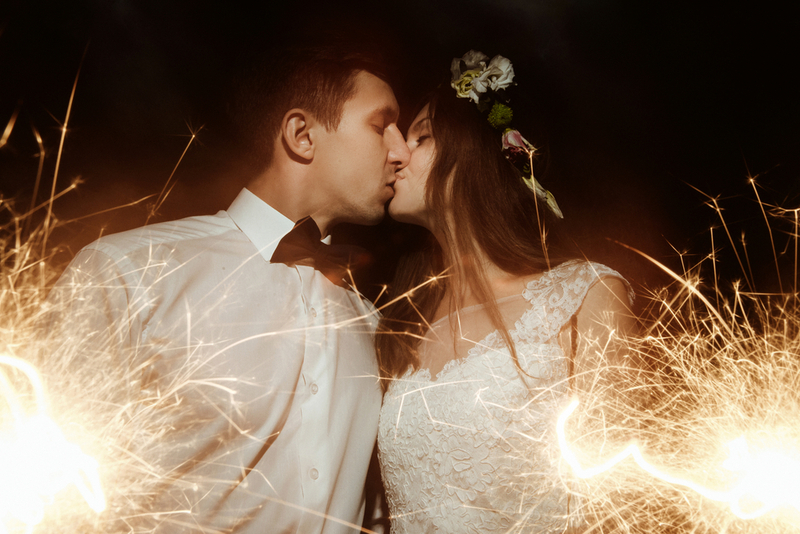 Don't start buying all of the materials that you will need for an elaborate sparkler reception exit before first asking the venue if they even allow fireworks. It would be horrible to make hand written signs, order the sparklers and matches, and fit the exit into your timeline, only to have someone at the venue tell you that fireworks are against their rules. If a sparkler exit is one of your "must-haves", make sure this question in on your list when you are choosing a venue. Once your reception venue gives you the thumbs up, look around to make sure there is a good place to make this sparkler exit happen. You will need an open space with plenty of room for your guests to line up, still allowing enough room for the bride and groom to run safely between them. Solid ground, like concrete or asphalt, is a much safer option than grass that could catch fire if it's too dry. Also do your best to stay away from any other foliage, wedding decorations, or parts of the building that could be flammable. An experienced photographer is a wonderful person to give you advice on how to execute a perfect sparkler exit. They should know from what setups make the best pictures. If they have not yet photographed your venue, ask the manger at your reception site for helpful tips too. It may be tempting to stock up on sparklers at the post 4th of July sale, but don't do it. Those are generally short and quick-burning. You will need the longer type that burn with enough time for a big group of people to collectively light them, line up, let you run through, all with ample time for your photographer to get some good shots. Whew! Test them before the wedding to get the timing down. Even though they seem much tame, sparklers are still fireworks. Purchase quality ones that you know will last and also be safe for your guests to handle. Bamboo sparklers are a lot cheaper than the wire version, but they break easily when being waved around, resulting in a major fire hazard. The extra price you pay for higher quality will be a lot less than you would have to pay for an ER bill! While many of your friends will want to stick around all evening and celebrate, some may not be able to stay until the end of the night. Make sure that you let everyone know that a sparkler exit will be happening, and at what time it will take place. That way, any guests that want to participate can make sure they stick around long enough to join the fun. You can put it in your wedding program or post signs at the reception. Also make sure that your guests know how to participate. Lighting a sparkler may sound like a simple task, but when you are trying to get a lot of people to do it, all at exactly the same time, it can get tricky. Have clear instructions, either posted or spoken to your guests, on the best way to light the sparklers, and exactly when to start. A "sparkler captain" is the perfect person to take care of this. Have one extremely responsible person in charge of your sparkler exit. They will be the ones making sure everything is done properly and in the safest way possible. They will also handle cleanup when it's all over. If you are serving alcohol at the wedding, this person will need to decide if anyone has had too many to handle fireworks. We also suggest not having the sparklers sitting out for everyone to access the entire night. 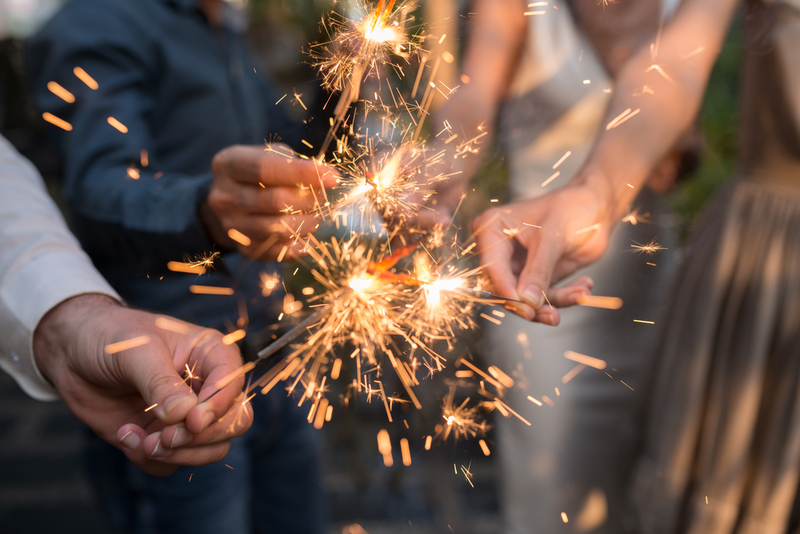 Let your sparkler captain pass them out when everything is set and ready to happen. This is the perfect time to give instructions. Once you have safely made your way through the sparkly aisle, the photos are taken, and the last spark has burnt out, there is still one more task to tackle. The sparkler captain needs to make sure that all of the used sparklers are disposed of properly, and any unused ones are gathered. Have a few metal buckets filled with water or sand for all of your guests to place their used sparklers in. This will cool them off enough to be thrown away without catching the trash bag on fire. 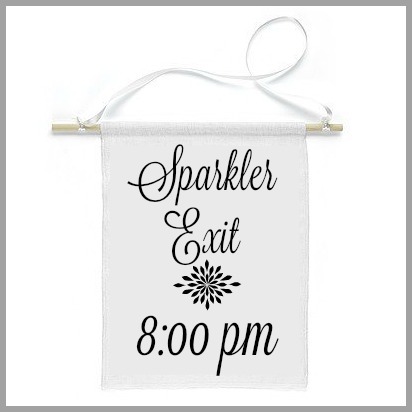 A sparkler exit is an unforgettable moment for both you and your guests. 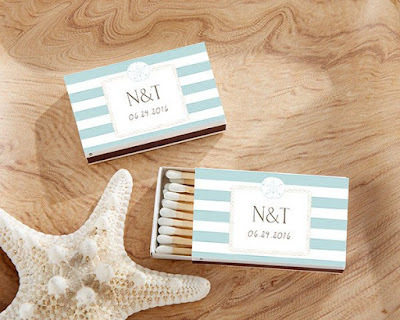 You can find personalized matchbooks and many other wonderful wedding accessories online when you visit our site. WhereBridesGo.com is always here to give you wedding tips, ideas, advice, and the greatest items to personalize your wedding and make it extra special.